I was under the general anaesthetic for about seven hours, from 3.30 in the afternoon to about 10.30 at night. I was back in the recovery room by 11.00 pm, having come round by this time from the anaesthetic. The facial feminisation procedures I had in November 2011 were: forehead/orbital reduction and eyebrow lift via coronal incision; rhinoplasty, and submandibular liposuction. You are in safe hands with the Facial Team, as they have done this procedure many times. In order to prevent swelling, I wore a cooling mask on my forehead, which was attached to a sort of portable chiller unit. I wore this until after lunchtime on the following day, when it was removed, and amazingly – I was ready to go back to the hotel! What on earth does this medical jargon mean? The following is my understanding of what happens in these procedures. Any errors in this description are my own, and it should certainly not be used as a guide to how to do it! Let’s start with perhaps the most difficult terms to understand: forehead/orbital reduction and eyebrow lift via coronal incision. This is maxillofacial surgery – bone surgery on the face, in other words. You will need this if you have a prominent, male-type brow ridge with low eyebrows and deep-set eyes, which need to be made more feminine in appearance. To achieve the forehead/orbital reduction, the surgeons make an incision across the crown of the head (a coronal incision), and the scalp is pulled back to reveal the brow bone, top of the eye socket bones, and top of the nasal bone. The brow bone and orbital bones are then worked on by both of Facial Team’s maxillofacial surgeons – Dr. Daniel Simon and Dr Luis Capitán. The relevant section of the frontal brow bone is removed, and the surgeon takes this away to sculpt it. It is important not to thin this section of bone too much. While one maxillofacial surgeon works on the section of bone which has been removed, the other surgeon works on the area of bone around and in front of the sinus canals where the removed section will be put back. The surgeon working on this frontal part of the skull also sculpts the orbital bones as necessary. The section that has been removed is then replaced and attached with titanium screws. These are smoothed and sculpted down so they don’t show! Any sculpting to the top of the nose bone is also done at this stage. 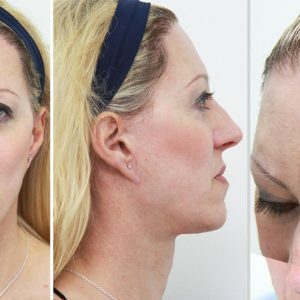 My treatment also included rhinoplasty and submandibular liposuction. Rhinoplasty is often referred to as a ‘nose-job’ – it can make the nose a different shape, reduce its size, change the tilt of it, or whatever. Liposuction is the removal of fat by suction. A couple of small flexible tubes (cannula) are put into the area to be treated and the fat is sucked out. You can have it on any part of the body where there is too much fat. Submandibular liposuction is used to reduce or get rid of a double chin. 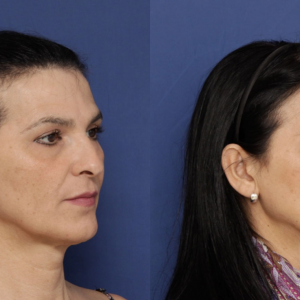 Both these treatments were performed by Dr. Kai Kaye, who is a very skilful and experienced plastic surgeon. So to summarize, I had three specialist surgeons working on me at different times during my surgical FFS treatment – two maxillofacial surgeons (Dr. Simon and Dr. Capitán); and one plastic surgeon (Dr. Kaye). Talk about feeling special! 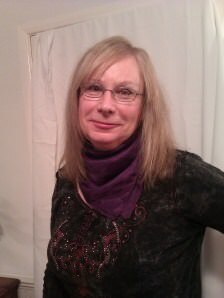 To keep up to date with Kate´s progress, subscribe to her blog: Ambergoth´s Transgender Weblog. You can also learn more about Kate on Ambergoth´s YouTube channel. Thank you Kate for sharing your experience with others!